This is the premier backcountry touring destination in Victoria. 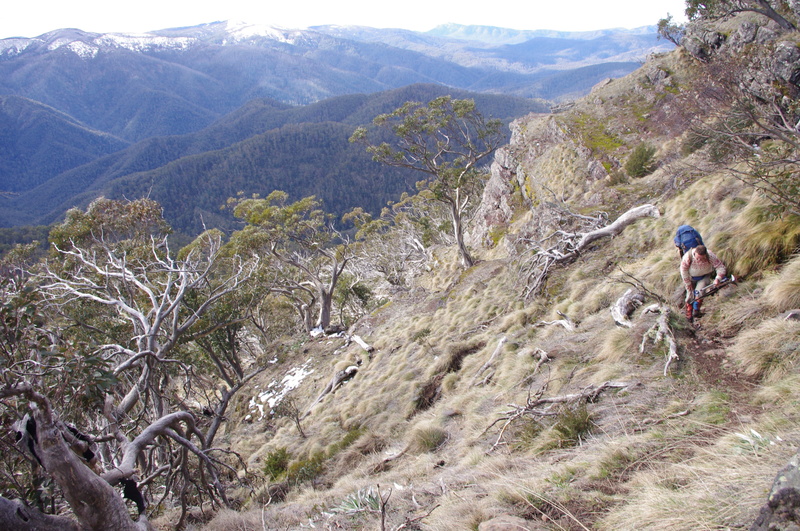 The high ridges that stretch from The Bluff to Mt Howitt sit to the south and east of Mt Buller ski resort in north east Victoria. The Bluff ridge stretches towards the Great Divide, where Mount Howitt provides incredible backcountry skiing. From here the impressive Crosscut Saw leads north to Mount Speculation and more forested plateau country to Mt Cobbler. The area has a feeling of winter induced remoteness (no trail bikes or 4WDs in winter! ), wonderful skiing and camping, and relatively easy access. An average trip would involve a minimum of four days, as the approach is slow (from the Snowy Plains to the south, via the Howqua River on the Mansfield side or in through the Cobbler plateau to the north). I originally wrote these notes for the backcountry ski wiki and have updated it slightly after recent trips. The premier destination is Mount Howitt, it sits as a hub, shedding water westwards into the Howqua system, south into the Macalister, and eastwards into the Wonnangatta. I would generally allow two days to ski in to Howitt from any of the three key access points. Once there, you would be mad to spend less than a few days at Howitt. The hut at Macalister Springs (a wonderful A frame named in memory of Vallejo Gantner) provides sheltered camping and a chance to get out of the snow, and most of the ridges up around Howitt offer spectacular skiing, from gentle wanders on the summit plateau to ripper gullies on the north side of the main peak and east facing slopes off the Cross Cut Saw and summit plateau. This is a remote area, meaning no tracks are groomed and access roads are not patrolled. If you have a chain saw or access to one, I would suggest bringing it, or at least a handsaw and axe so you can get out once you’re back at the car. I have had large trees fall onto the roads while I have been skiing and had a few adventures getting out. The roads can be very muddy. If heading in to The Bluff, be aware of a section of road that can be difficult. After you have left the Howqua River at Eight Mile Creek and climbed to the top of the divide at Eight Mile Gap, the road snakes around the south side of Rocky Ridge. This section, of about 5 kilometres, can be extremely icy and hold snow late into the season because of its southerly aspect. It would be very expensive to get hauled out, so I would tend to be on the cautious side and check any dodgey looking sections before driving them. There are a handful of huts in the area: Bluff hut (burnt in recent fires and rebuilt), Lovicks and at MacAlister Springs. This means you need to be self reliant with camping gear, etc. While phone coverage is fairly good, especially from the ridgetops, rescues may take some time to arrive, meaning you need to ensure you have a good first aid kit and ideally a survival bag/ bivvy bag in case you have an injured person requiring protection from the elements. It doesn’t hurt to bring an extra ski tip, strong tape to fix broken ski poles, etc. The section from Mt Howiitt to Mt Speculation, and The Bluff Summit and Mt Eadley Stoney to Bluff hut are the most exposed and can be icy. The rest of the ski routes are through snow gum woodlands, and often on summer 4WD tracks. I love the S.R. Brookes maps published by BushMaps Victoria. The one covering the Buller – Howitt area is Watersheds of the King, Howqua and Jamieson Rivers. This will work for access from the Howqua or Lake Cobbler but if travelling in from the south you will also need Stuart’s Snowy Plains – Mt Wellington map as well. 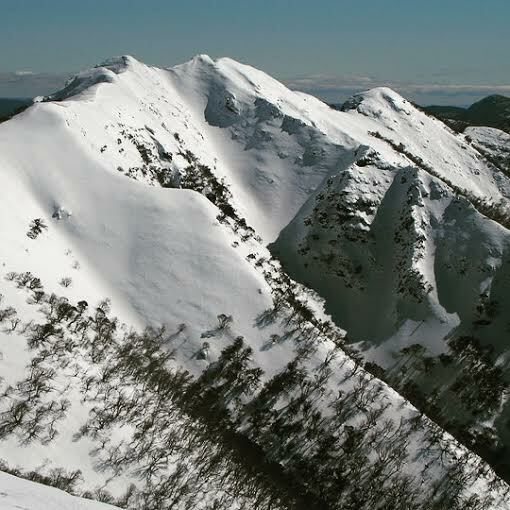 Spatial Vision has a great 1:50,000 map of the Mt Buller – Howitt area. See below for further details on these options. These three generally allow you to ski in, as you start relatively high. The exception can be the Bluff trail if you start near Refrigerator Gap, which is often a walk and then scramble rather than a ski to get to the summit of The Bluff. All have long drives to the trailhead. – out or in via the Howqua river feeder track (from Eight Mile Flat) to Bindaree and up Howitt Spur. This can be a great escape route from Howitt when the weather is going to be bad for several days, however, be aware that you need to be picked up at Eight Mile Flat, otherwise its a huge walk up Rocky Ridge to retrieve your car if its up on the Bluff road. This section from Eight Mile Gap is south facing and usually snow covered and can be slippery so take your time. After Refrigerator Gap, stay on the road, climbing gradually till you see an area to pull off and park, with a sign point to The Bluff. This is where I normally put in, but if you want to avoid the joy and pain of climbing the Bluff, stay on this road for a few more kilometres, travelling under the impressive cliffs of Eadley Stoney, before taking a right turn up to Bluff Hut (burnt in recent fires). It is usually locked here, leaving a gentle walk of only a few km to get to the hut site. You are now at the western end of the high ridge that runs back to Howitt, about a days ski from that mountain. Travel in either through Mansfield and Tolmie to Whitfield or the ‘Snow Road’ between Wangaratta and Gapstead/ Myrtleford (turning south towards Whitfield just to the west of Oxley). From the nice little township of Whitfield, continue south through Cheshunt and take the road to Mt Cobbler. The roads here are north facing for the most part and lower then the road from Eight Mile Gap so may be a safer bet in a heavy winter. The road is closed just before Lake Cobbler and is a good 2WD track to this point. The best bet is to head up roughly straight east of the lake to the edge of the plateau (some great runs come off the escarpment) then detour to the summit of Mt Cobbler (a great side trip). From here its a nice two day ski southwards to get to Howitt. The other option from where you park the cars is to follow the 4WD track towards Mt Speculation. This has a fair bit of up and down and may require a fairly long walk in average snow conditions. This is the winding ridge country that stretches from Mt Cobbler southwards over Mt Koonica to Mt Speculation. This is mostly open snowgum woodland, with the constant presence of the lights of big city Mt Buller on the west, and the possibility of some nice steep runs off the main north/south escarpment, all the way along from Cobbler itself towards Mt Koonika. This area has been burnt in recent years so the regrowth can be intense in some sections. The escarpment skiing is best in a heavy winter. 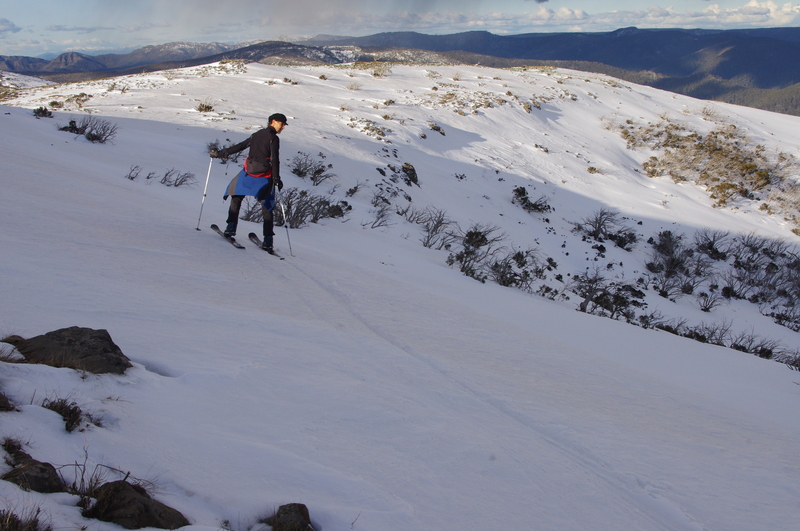 In condition, there is fantastic skiing (and occasional climbing) on the southern slopes below Mt Cobbler itself, which is separated from the Cobbler plateau by a narrow ridge. Speculation offers a wonderful, if exposed camp before exploring the most dramatic section of this country, The Crosscut. The northern slopes of Speculation can offer some nice skiing down the broad valley that the summer walking track follows and also off the high point of the mountain through snow gum woodlands. This is an iconic ridgeline, often nastily icy and windblown, with bluffy cliffs along much of the west side and deep, deep gullies dropping into the Terrible Hollow and upper Wonnangatta on the eastside. Some of the best big drops can be found on this side (leeward to the wind, often holding snow way down into the gullies after big dumps). It is definitely worth checking out the top of Stanley Name Spur to see what condition it is in. This is serious terrain, similar to the steeper sections of The Razorback, and rescue could be slow if something goes wrong, so stay within your limits. Assess slopes for avalanche risk, and be aware that cornices can form along sections of the Crosscut. It can be very dangerous in icy conditions. For a sense of what the Crosscut Saw is like, and what to expect in terms of conditions, check this short film from Mark Oates. Lots of options here. Hang out with the ravens on the west ridge, or tour easy country on the big flat summit plateau. For the serious skiers, there are deep chutes and gullies on the north side of the summit plateau as it stretches out towards West Peak (when in condition). The gullies tend to be grassy, so can be skiable/ rideable with only limited snow. There are good sheltered runs from the summit plateau back down into the headwaters of the Macalister valley when its too windy up on top (drop down right into the valley as you approach the connector ridge to Crosscut saw rather than veering left to follow the snowpoles to Mac Springs – its pretty obvious). If you follow the ridgeline out below West Peak heading into the Howqua there are some great camping spots as you get into the trees at the start of the Howqua Feeder Track. There are also nice mellow runs down towards the Big Hill saddle through open woodland. This is a great section of ridgeline. After leaving Howitt you have a cruisey sidle around Big Hill and then a climb through exposed country around Magdala, with big slopes and Hells Window, before climbing back into trees for that long ski back towards Bluff hut saddle. The ski from near Mount Lovick to Bluff hut saddle is mostly through snow gum, there is a 4WD track that is normally pretty obvious. If you have the time there are some good runs to check out – eg southern slopes of the big obvious slope below Mt Lovick, where you get great views of Mt McDonald. Lovicks hut has been rebuilt since being burnt out in fires and is quite comfortable. Mellow southern side of The Bluff. Spring conditions. Cut on the north by cliffs, and sloping off gently to the Macalister River on the south, this is a charismatic mountain. 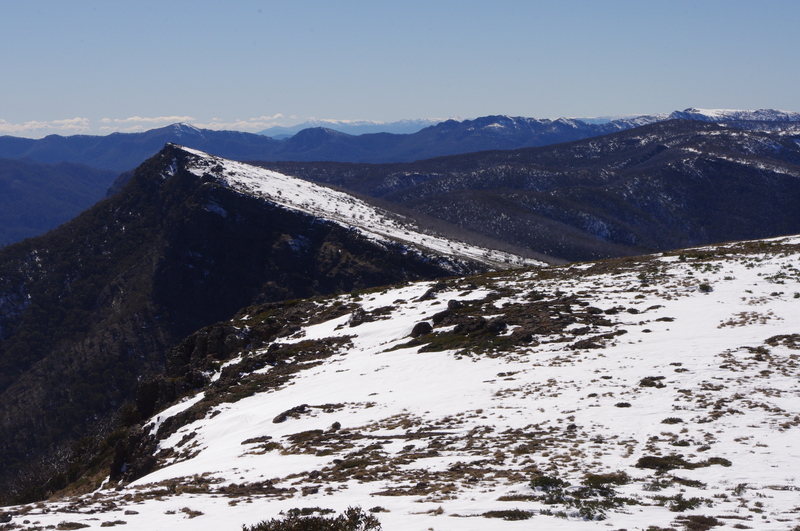 If you haven’t been into the Howitt region before, make sure you climb The Bluff rather than taking the easier option of cutting up to Bluff hut saddle when coming in from Eight Mile Gap. Its a lot more effort but well worth it. 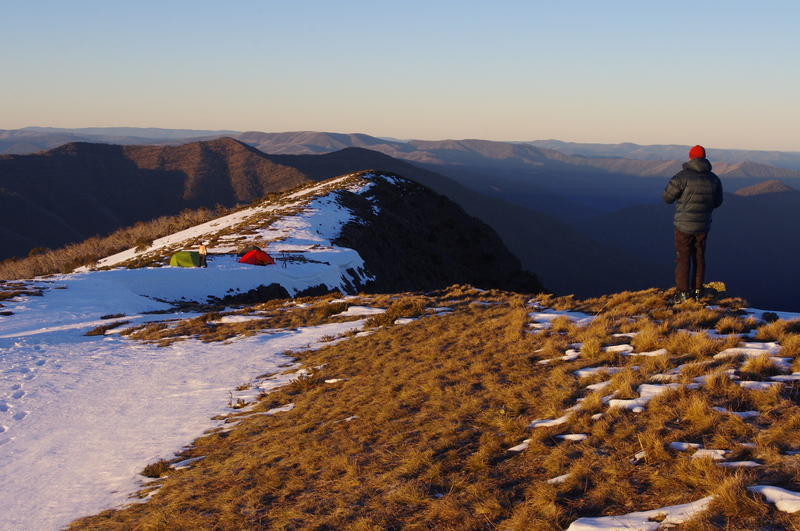 There is good camping amongst a little clump of snowgum near the summit, on the exposed summit area, or out on the far western end of the summit ridge, where the storms rip in after a big rise from the surrounding valley. It can be icy up on the summit. When it gets a bit nasty, drop down into the trees around the Blowhole for sheltered camping. There is also good sheltered camping in the little valley directly south of the summit (you need to go south from the summit to actually see it). There is a low ridge that protects this basin from the worst weather. There are nice mellow runs right along the southside of the summit ridge. There are some good longer runs from the end of the mountain before you descend to the Blowhole, heading south east. The north side of the mountain is something else, it is mostly broken by cliffs and snow tends to burn off fairly quickly because of its aspect. However, the big gully below the Blowhole can be skied when in condition. The climb up the north side of The Bluff. Even in late spring, the southern slopes can hold good snow, long after its burnt off on the summit ridge.